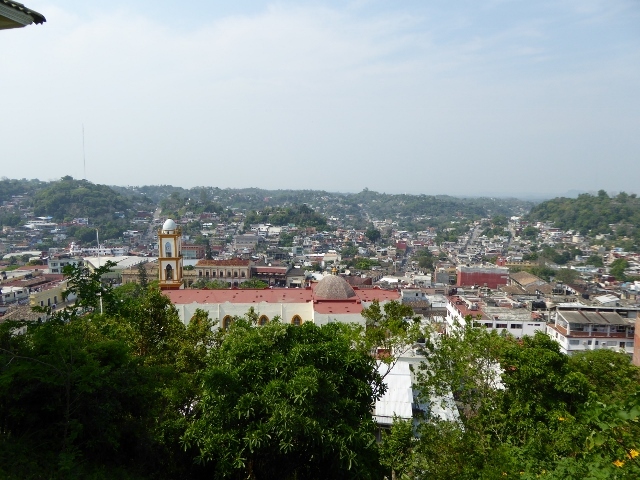 Just a quick post for a quick two night visit to the small town of Papantla. 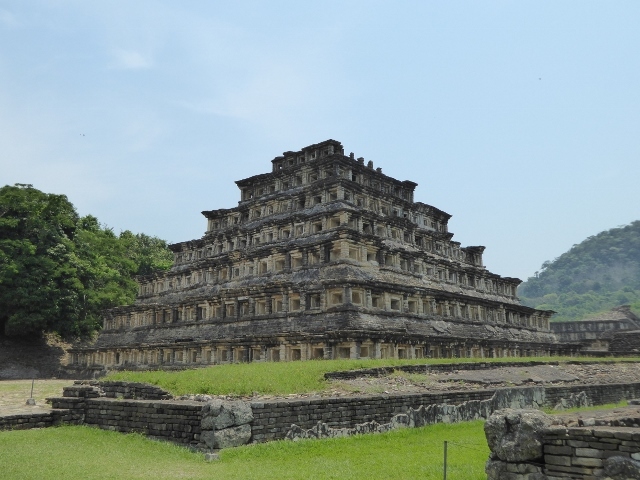 Our reason for staying here was solely to go see the ruins of El Tajin, another archaeological site. We are beginning to stack up the list of old ruins we have seen in Mexico. 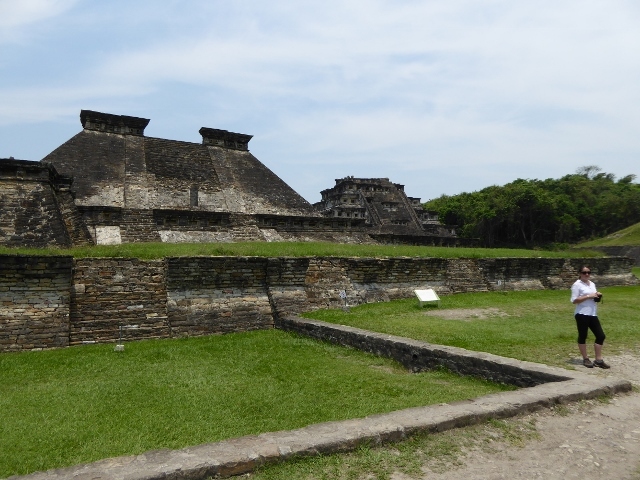 Check out my older posts where we have visited Xochicalco, Teotihuacan, Cholula and Cantona which were all interesting but still different in their own ways. Upon arriving in Papantla and stepping out of the bus we were greeted by heat and high humidity. Walking the four small blocks to our accommodation got us sweating easily and I was very happy to take off my pack. A change of clothes was my number one plan as I was (for some stupid reason) wearing jeans. Water was a necessity and not supplied with the place we stayed so we brought a big five litre bottle which didn’t even last 24 hours. Sweating profusely we walked to the zocalo to find food. Neither of us were used to this heat anymore, it was like a Perth summer with the humidity cranked up. The fan in our room was noisy but we tolerated it to get to sleep that night. Being the cheap backpackers we are we opted for only a ceiling fan over an (old) air-con unit and stand fan to save peso. Our logic was that we wouldn’t be able to sleep with a noisy air-con running either. I internally questioned this logic a few times during our two night stay. The next morning showed signs of being hot again so we packed our water, ate some fruit for breakfast and headed for the bus. After waiting for about an hour (we must have just missed a bus) we were on our way to El Tajin. The bus only took about about half an hour so we were soon back out in the heat. Our short walk to the entrance was full of people trying to sell us food, clothes and other assorted touristy junk we definitely didn’t need. But being a Monday I imagine there was a lot less vendors than if it had been a weekend. The site isn’t huge but the quality of the pyramids is well done and very different stylistically from others we have seen. This is obvious to see in the Pyramid of the Niches, which to me almost has the vibe of an Asian temple. 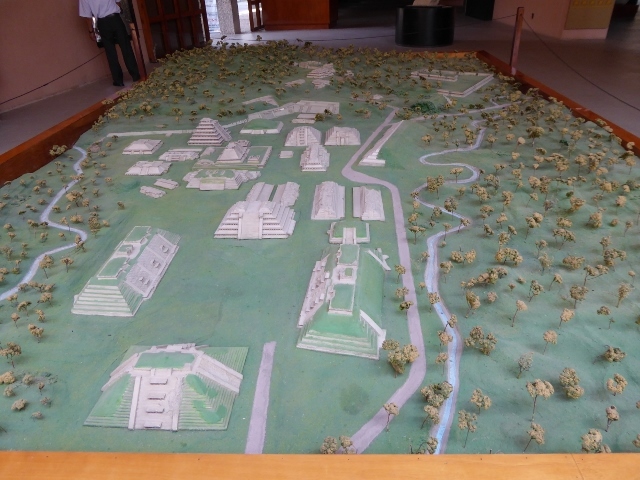 The different structures seem to have a lot of decorative elements as well as plazas from where you can see the grandiosity of the most important pyramids. Towards the back of the site there was an area under restoration where we could see staff working on uncovering or perhaps preserving some frescos on the side of a temple/pyramid/building. I would have loved a little more information on what the process was but distance to where it was happening and lack of Spanish made that impossible. After exploring the site sufficiently we walked back to the entrance all sweaty and gross looking from the heat. At least everyone else looked the same as us. Even locals from the area were affected and complaining about the weather so we knew it was irregularly hot. I can only hope that continuing on our travels we don’t encounter more humidity and heat like this, or at least I can hope to become magically acclimatised to it. Just before being dropped off by the bus that morning we had seen a stand selling crema de coco agua frescas nearby so we headed there for a refreshment. Cold coconut beverages in hot climates really hit the spot and Tom drank a whole litre so I had to get a cup for myself, only 500 ml mind you. Catching a bus back to Papantla we still had a few hours of afternoon left which we dedicated to food, exploring, relaxing and then more food in that order. We couldn’t really justify heading straight back to our room to sit under the fan as we only had the single day in Papantla. Food came first so we chose a cheap fonda for it’s air-con and had the easy choice of tortas with another large jug of agua fresca to keep hydrated. Wandering around the town in what ended up being a 43 degree day was a little crazy but made us feel like we saw a bit more than just the ruins. There is a cute zocalo and up the hill is a tall statue of a Volador. Voledores are the people that perform the crazy aerial feat of hanging from their ankles while spinning around a tall pole and slowly lowering to the ground. This is accompanied by a recognisable tune of flute music. I can’t really describe it better than that. 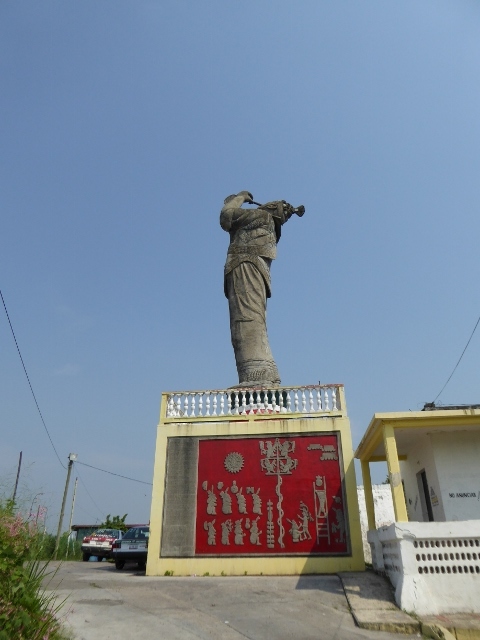 We have seen them in Mexico City and Cholula but the Voledores de Papantla seem to be the most famous. After a cold shower and some time relaxing under the fan in our accommodation we felt more human. After the sun had set the temperature also dropped a little (it was still mind numbingly hot though) and we felt like a bite to eat. Earlier in the day we had found the market but the food area was just too warm to contemplate. It was still open when we passed by so we each had a few tasty tacos. Yes it was a lazy/unhealthy food option day for us. The next morning we happily headed back to the bus station with our fingers crossed that our bus would have air conditioning and our next destination would be a little cooler.